Minimize water consumption with optional ec-H2O NanoClean™ Technology*. Programmable Zone Settings™ for your unique conditions. Multiple head options to fit your cleaning environment(s). New machine electronics allow the machine to do daily cleaning of finished concrete surfaces and works with 3M™ Trizact™ System. *ec-H2O NanoClean™ technology is not designed for all soils, including heavy concentrations of fats and oils. Conventional chemical cleaners may be required for those soils. 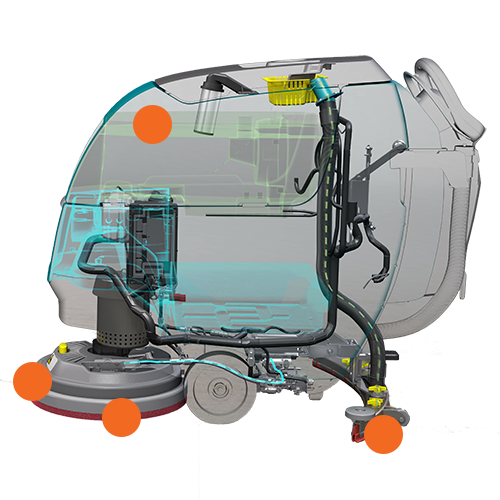 Get superior cleaning performance from your T300 with TennantTrue® parts that have been designed specifically to help maximise cleaning effectiveness in one pass and achieve better cleaning performance at a lower total cost. 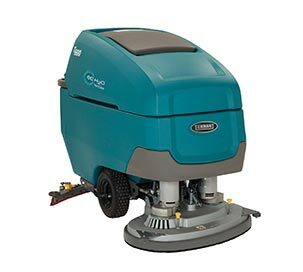 Tennant offers a variety of floor scrubbing pads for use in a wide range of floor cleaning applications including stripping, scrubbing, cleaning and polishing. Achieve better performance while lowering costs associated with rework, labour, safety and maintenance by using genuine TennantTrue® brushes, specifically designed for your T300 machine. Don’t settle for less - choose TennantTrue® brushes! 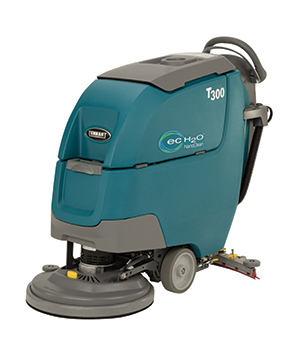 The squeegee is one of the most critical parts on your T300 scrubber. Only genuine TennantTrue® squeegees are designed specifically to fit your T300 machine to deliver exceptional liquid collection and pickup for optimal cleaning performance. The correct fit helps reduce downtime and service calls, lowers labour costs and puts money back into your business. Optional T300 LCD Pro-Panel™ on-board video helps ensure the machine is operated in a safe manner for optimum results, simplified training and reduced cleaning costs. 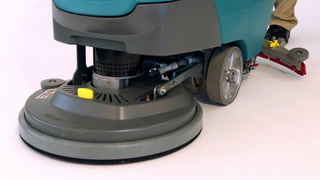 Optimal down pressure and RPM improves cleaning performance, helping to lower your labour costs. 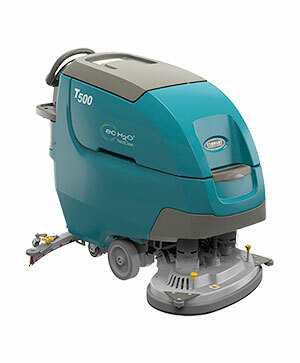 Effective scrubbing capabilities help to maintain a consistently clean appearance of your facility floors. Zone Settings™ allows operators to easily identify lightly soiled areas. Flow control valve reduces the risk of contact with dirty recovery water and decreases the need for secondary cleaning operations caused by spills. Quiet-Mode™ low dBA kit reduces noise levels, allowing for easy daytime cleaning without disruption. 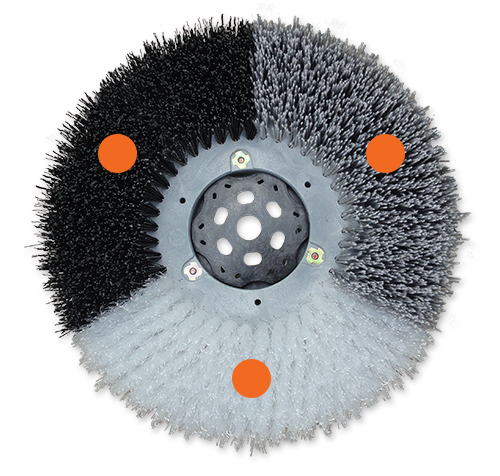 Dual cylindrical brushes clean grouted areas and pick up large debris. Innovative features helps protect the health and safety of your operator, customers, and the environment. Insta-Click™ patent-pending scrub-deck allows TennantTrue® pads and brushes to be installed ergonomically, resulting in a safer, faster and low-touch installation. 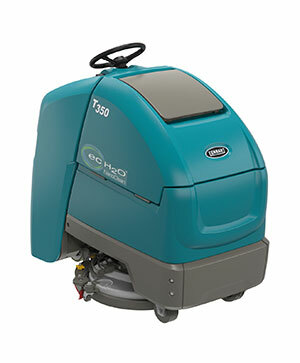 The Insta-Click™ scrub-deck is standard on the T300. Squeegee design helps ensure dirt and soils are removed from the floor for minimum risk of slip-and-fall accidents and enables faster, easier installation of replacement TennantTrue® squeegee blades. Use of ec-H2O NanoClean™ reduces the consumption of daily floor cleaning detergents to help meet your sustainability goals. ec-H2O NanoClean™ with optional Severe Environment™ switch eliminates secondary cleaning operations that could increase slip-and-falls. 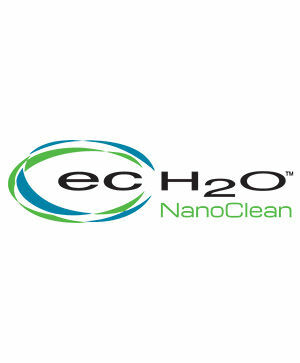 ec-H2O NanoClean™ technology electrically converts water into an innovative cleaning solution that cleans effectively, saves money, reduces environmental impact compared to daily floor cleaning chemicals. This converted water is created by an on-board e-cell that generates millions of very tiny microscopic bubbles known as nanobubbles that promote the cleaning efficacy of the solution. This next generation solution offers the same great benefits of the first generation and now cleans better by cleaning more soils in more applications.